How to celebrate Semana Santa like a Spaniard. This year Easter Sunday falls on April 1st but celebrations of the biggest religious festival of the year begin a week earlier. Music also plays an important part in Semana Santa processions – most are accompanied by live marching bands that play religious music. People taking part in Semana Santa processions dress in traditional capirote – the tall conical hat which also covers their faces, as well as in belted robes. Women often wear the mantilla, a black lace veil worn high on the back of the head. Last year, Alicante issued fashion guidelines for women taking part in the city’s Easter processions and made it clear red lipsitck and skirts above the knee were definitely not allowed. In Málaga, giant tronos, or thrones, are carried through the streets by members of brotherhoods dressed in long purple robes and followed by women dressed in black and wearing the typical mantilla, or lace veil. There is a real festival atmosphere in the city during Holy Week, much livelier than some of the more sombre celebrations in Spain’s northern towns and cities. 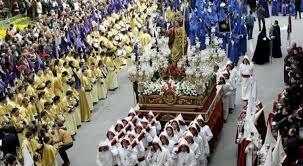 Zamora lays claim to the oldest Semana Santa celebrations in Spain, which date back to 1179. The city, close to the Portuguese border, sees its population increase five times during Holy Week, as up to 300,000 people flock to watch the ancient traditions. Spaniards will tell you “it always rains in Semana Santa” and this year they will most likely be right as stormy weather brings a drop in temperatures and frequent showers across much of the peninsula. So, if you are heading to the parades, make sure to carry an umbrella.